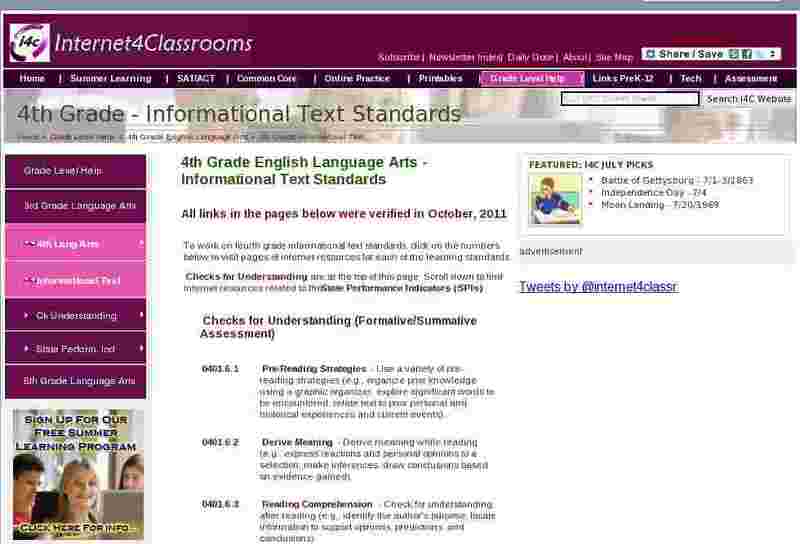 To work on fourth grade informational text standards, click on the numbers below to visit pages of internet resources for each of the learning standards. 0401.6.1 Pre-Reading Strategies - Use a variety of pre-reading strategies (e.g., organize prior knowledge using a graphic organizer, explore significant words to be encountered, relate text to prior personal and historical experiences and current events). 0401.6.2 Derive Meaning - Derive meaning while reading (e.g., express reactions and personal opinions to a selection, make inferences, draw conclusions based on evidence gained). 0401.6.3 Reading Comprehension - Check for understanding after reading (e.g., identify the author's purpose; locate information to support opinions, predictions, and conclusions). 0401.6.4 Text Features - Use common text features to enhance understanding (e.g., headings, key words, graphics, captions, side bars). 0401.6.5 Sequence - Understand sequence of events from text. 0401.6.6 Main Idea - Determine the main idea and supporting details from text. 0401.6.7 Preview Text - Preview text using text features (e.g., illustration, graphs, diagrams). 0401.6.8 Variety of Texts - Understand a variety of informational texts, which include primary sources (e.g., autobiographical sketches, letters, diaries, Internet sites). 0401.6.9 Parts of Text - Use parts of text (e.g., title, title page, table of contents, chapter title, glossary, and index) as aids in understanding informational text. 0401.6.10 Follow Instructions - Follow multi-tasked instructions in informational and technical texts (e.g., follow a recipe, complete assembly instructions). SPI 0401.6.1 Ask Questions - Select questions used to focus and clarify thinking before, during, and after reading text. SPI 0401.6.2 Main and Support - Identify the stated main idea and supporting details in text. SPI 0401.6.3 Locate Information - Use table of contents, title page, and glossary to locate information. SPI 0401.6.4 Meaning from Text - Use headings, graphics, and captions to make meaning from text. SPI 0401.6.5 Interpret Chart - Interpret information using a chart, map, or timeline. SPI 0401.6.6 Use Features - Use available text features (e.g., graphics and illustrations) to make meaning from text. SPI 0401.6.7 Sequential Order - Arrange instructions in sequential order.